8h00pm Pick you up from your hotel in Hanoi to Hanoi Railway Station for the night train at at 9:15 PM to get to Laocai Station. Sleep on the train. (4 people/cabin or 2 people/cabin on request). Arrive at Lao Cai railway station in the early morning where the driver is waiting to drive you along the exciting curvy road, surrounded by steep mountains and rice fields on terraces to Sapa. Arrive at Sapa round 8:00 AM; Breakfast and start to get to Laochai village. Enjoy the overall pictures of the villages among terraces. Visit the H’mong living in wooden and bamboo houses. Continue going to Tavan village to visit the Dzay minority. Stay the night in Tavan village at a Dzay family. Picnic lunch on the way and dinner at the home-stay. Get up early in the morning to enjoy the daily life of the ethnic minorities in the village. Breakfast; take the road to GiangTaChai village of the Red Dzao minority via the paths between terraces and through bamboo forests. 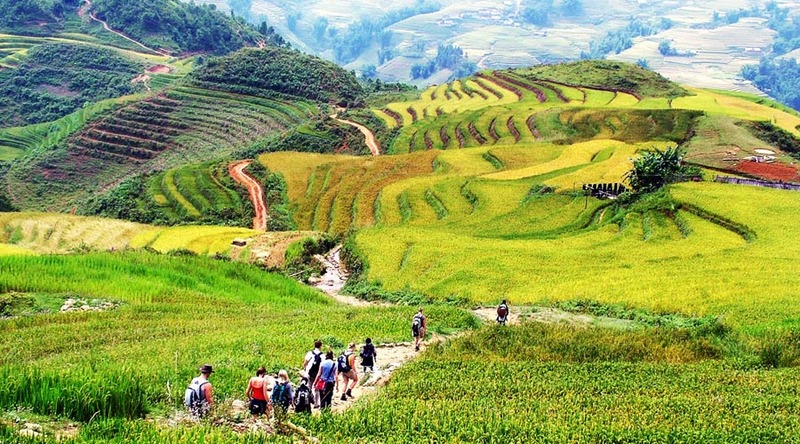 Visit silver waterfall and suspension Rattan Bridge, visit the people in the village and then cross Muong Hoa River up to the mountain to visit the last village of the trek – Supan village of the H’mong. Get back to Sapa by jeep. On the way back, enjoy visiting the ancient stone circle where stones are decorated with ancient carvings. Check in hotel. Breakfast, visit village of the black H’mong Catcat, walk around visiting people in the village and the hydroelectric power station built by the French in the old days. Back town have lunch and check out hotel, free to explore the town until take bus to get to Laocai Station for the night train back to Hanoi. The train arrives at Hanoi Station at around 5:00 am in the next morning. Taxi to hotel on your own.Tour ends. – Personal expenses, emergency transfers.